It goes without saying that social media has not only become incredibly important, but it can actually make or break your business. 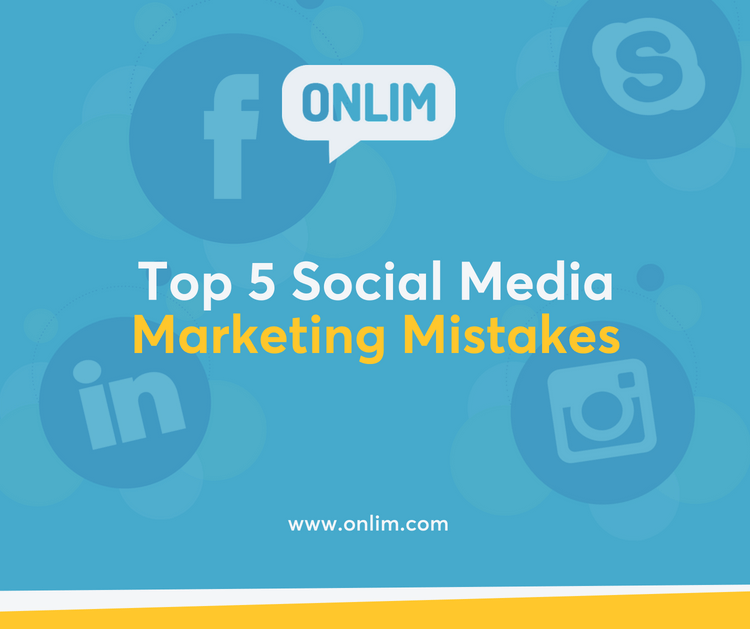 Therefore, we have collected the top 5 social media marketing mistakes for you. And of course, also offer tips on how you can avoid them to run your digital marketing successfully. One of the most common mistakes is not having a proper social media marketing strategy in place. Instead you post to your social networks without defining what your overall goals are. It’s easy to blame your followers, a low budget, lack of time, or even your product/service for not performing well on social media. However, you might want to take a step back and look at the very basics of effective social media marketing. What you need is a strong foundation. Otherwise you might end up with a page full of content that doesn’t help you achieve your business goals. How can social media help me achieve my business goals? What do I want to achieve with my social media activity? Who is my target audience, and on which platforms can I find them? How can I measure the success of my activities? What are my key performance indicators (KPIs)? Which team members will take care of which tasks? Laying out a solid plan and then sticking to it is the first step to getting the most out of your social media marketing. Your customers and followers might be reaching out to you via social media asking for help, or for information on a certain topic. While you might have other support systems in place, don’t make the mistake of not offering advice on social media as well. By responding to comments, questions and reviews, even when dealing with negative feedback, you can build strong relationships with your audience. Your followers will not only appreciate your reply but there is a good chance they will even anticipate it. According to Smart Insights 63% of customers expect customer service via social media channels and 42% of those expect an answer within an hour. Do you follow people or companies who constantly try to sell you, promote themselves non-stop, or post content that you can simply not relate with? Probably not. And neither do your followers. It is not all about sales. You need to build trust and a strong brand first. And the best way to do this is by giving value. Really think about what it is that your audience needs or likes. Post content that offers useful information, is of interest to your followers and sparks emotions. In return, it will automatically bring engagement and serves as a foundation for a successful social media marketing campaign. For instance, taking the time to research a list of tips that are valuable to your audience and giving this list away for free won’t lead to profits right away. However, it helps you build trust, thought leadership and an engaged community that will be more willing to spend money on your business later on. Another common social media marketing mistake that you should avoid is not acting like yourself or hiding behind your brand. After all, it is called SOCIAL media for a reason. Be human, be real, and write your posts, comments and replies like they come from a real life person (or a 21st century robot ;)). Your followers will enjoy the personal touch. And it will make it a lot easier for them to relate to you and your business. Being visible, sharing engaging content and active contribution on multiple social media platforms can soak up your resources in no time. Hence, having the right tech stack in place can improve your social media performance! There are some great tools every social media marketer should be using out there. They can that help you create & curate content, schedule posts on various platforms, collaborate with your team, find the right hashtags, design appealing graphics and more. Moreover, you can save time by using social media management tools like Onlim to schedule your posts ahead and that automate your processes and allow you to keep an overview of the content calendars of all the different platforms at a glance. There are many things that you can do wrong as an online marketer, but if you keep these 5 tips in mind your social media marketing is laid out for success.